Nothing beats the smell of freshly baked bread coming out of the oven. 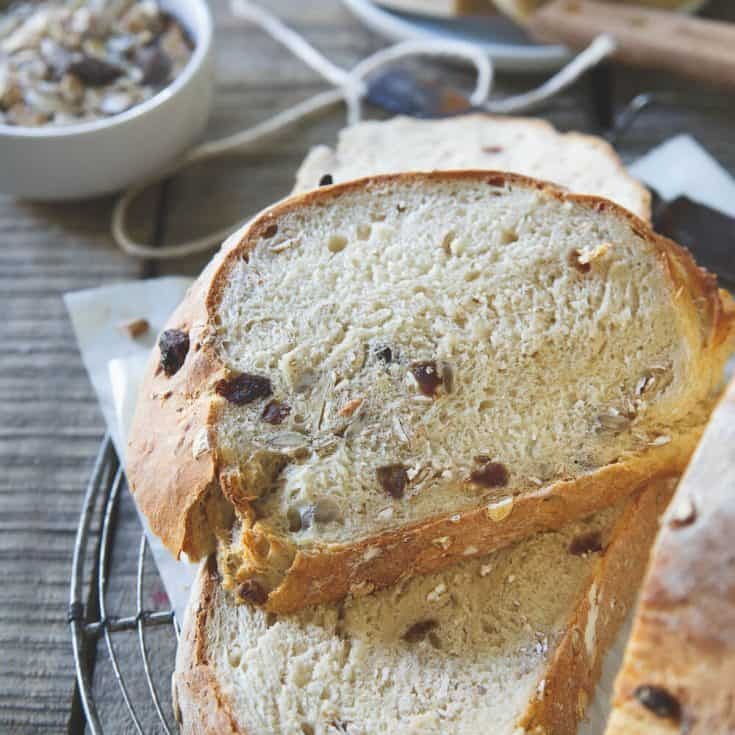 This hearty muesli bread is begging to be slathered with some butter and enjoyed warm! A few weeks ago, we watched the Michael Pollan series on Netflix. I freakin’ adore Michael Pollan. He single-handedly changed my outlook on food back in 2009 when I was on a mission to lose 15-20 pounds, get healthier and start running (you can read all about that journey on my about me page) with his book, In Defense of Food. To this day, I still think his coined phrase “Eat food. Not too much. Mostly plants.” is a great one to live by and the simplicity of it all is a refreshing change of pace in this time of crazy detoxes, niche diets and other food fads that pop up seemingly every other day. Thanks to partner, Bob’s Red Mill for sponsoring this post. From the buzz I’d heard surrounding the four-part series focusing on the basic cooking techniques of fire, water, air and earth, air was apparently the most inspiring episode. People were all “I’m going to make my own bread every day!” after watching it and of course, being the skeptic I am, I told myself that while I’m sure it would be a great episode, there’s no way I’d fall into that trap. It was the one episode Ulysses happened to watch with me and we both were completely inspired after just 60 minutes of talk about real, fermented artisan bread. The kind of bread our ancestors made, not the quick breads of today ready in 30 minutes or the box mixes you add an egg and some oil to. He even turned to me while the credits were rolling to say “I really think you should give this a shot”. In my head the response was “haha, thanks, babe, I’ll just add that to my daily to-do list, no prob” but truthfully, I was interested too. A few days went by, I googled all the things, talked to a bunch of people and was convinced I was ready to make my own starter from scratch and be the kind of person who has one of those fermented blobs living on her kitchen counter for the sole purpose of baking bread the real way. But then life kicked in, we went to Florida for a week, schedules got hectic and here we are a month or so later and I still haven’t done it. To be honest, I’m not sure it’s in the cards. I can barely keep myself together enough to accomplish the work I have in a given day, dedicate 2 hours to the gym, still have time to spend with my husband and sleep a solid 8 hours (I’m not pleasant without at least that much) let alone, deal with bread baking and a living, breathing starter that needs to be “fed” daily. The only person in this world I can promise to feed is myself. So, I made a compromise. One which involved store bought yeast for this muesli bread. No, it’s not fermented and doesn’t have all those lovely gut-happy probiotics but it’s still fresh bread, from scratch without the crazy ingredient list you find in store-bought loaves and that’s something good enough to consider a win in my book. 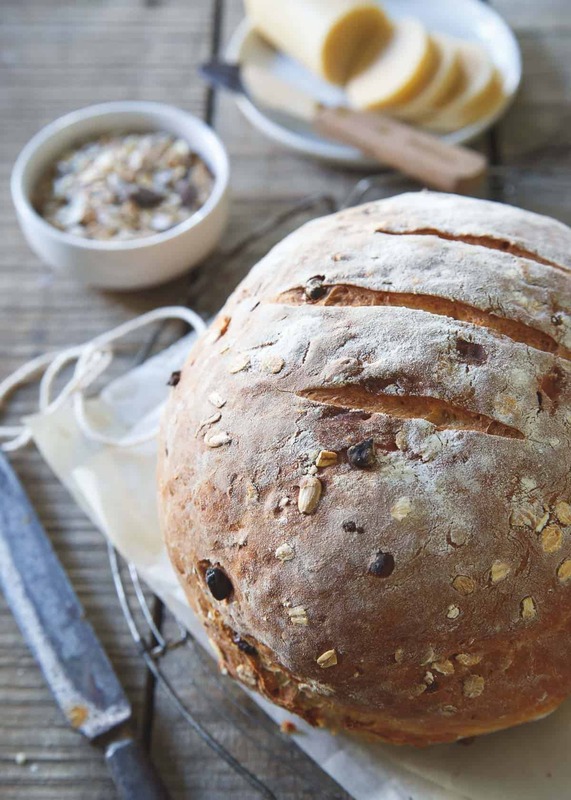 There’s really nothing quite as intoxicatingly delicious smelling as freshly baked bread coming out of the oven and when you add a hearty muesli, like Bob’s old country style muesli to said bread, the result is something out of this world addictive. I dare you to bake this and resist slathering some butter (I’ve had a maple sea salt one from Vermont Creamery hanging out in my fridge for months just waiting for an occasion like this) on a slice immediately. I’m telling you, it’s impossible. 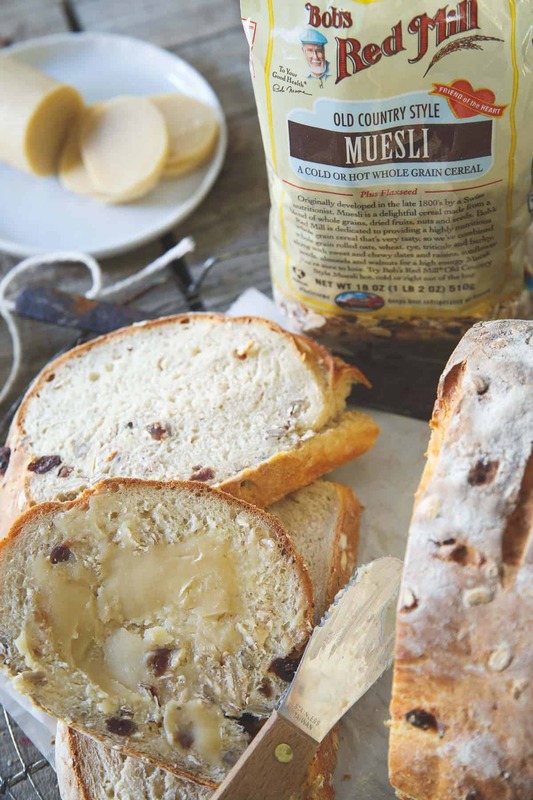 Muesli is basically like oatmeal and granola combined into one amazing cereal mixture and while it’s great eaten hot on its own for breakfast, worked into freshly baked bread, it provides the perfect hearty artisan texture you crave from a scratch made loaf. Combine the milk, water, yeast and honey in the bowl of a stand mixer. Stir gently and let yeast proof, about 10 minutes. Add flours and salt to the mixer bowl and mix with dough hook on low-medium speed. Dough will be sticky, use additional flour if needed to pull it together just enough so that you can transfer it to a greased bowl. Cover dough in greased bowl, set aside in a warm place and let rise for 1-2 hours until at least doubled in size. Remove dough out onto a floured surface, knead the muesli into the dough until well incorporated throughout. Reshape into a loaf and place on a parchment or silpat lined baking sheet. Cover, set aside and let rest for 30-45 minutes. Score the top of the dough with a knife and place into the oven to bake for 25-30 minutes until golden brown on the outside. Remove from oven, transfer to a cooling rack and let rest for a bit before slicing. Best served warm with butter. My family LIVES for fresh baked goods. There’s nothing that pleases them more than living near a bakery that makes their pastries and breads from scratch every morning and delivers them warm from the oven. While they do pride more off croissants, they will definitely love this recipe! Perfect blend of fluffy bread and healthy muesli! To be honest, making my own bread totally intimidates me! But, this sounds SO good that I think I might just need to get over my fear, because I need this for breakfast! How beautiful is this bread?! Love! I share the same exact feeling towards Michael Pollan as you do. He changed my view of food too! I have been wanting to watch that series, I started to and I’m glad you reminded me to go back to it. This bread looks incredible. I love Bob’s Muesli so much (so do my kids) and to include it in fresh baked bread is genius!! I need to add the Michael Pollan series to list of must watch series, shows like that fascinate me! This bread looks amazing, so tender and light, but full of wholesome ingredients. Love that you included Bob’s Muesli, so much great texture and flavor added in! I’d love a slice of this hearty bread. This looks great Gina! I feel the same about Michael Pollan and you reminded me I have not watched his series! His books and that very phrase were really catalyzing to me focusing on local food and falling in love with the food community. I’m thinking I need to add some muesli to my grocery list – this looks so good!! 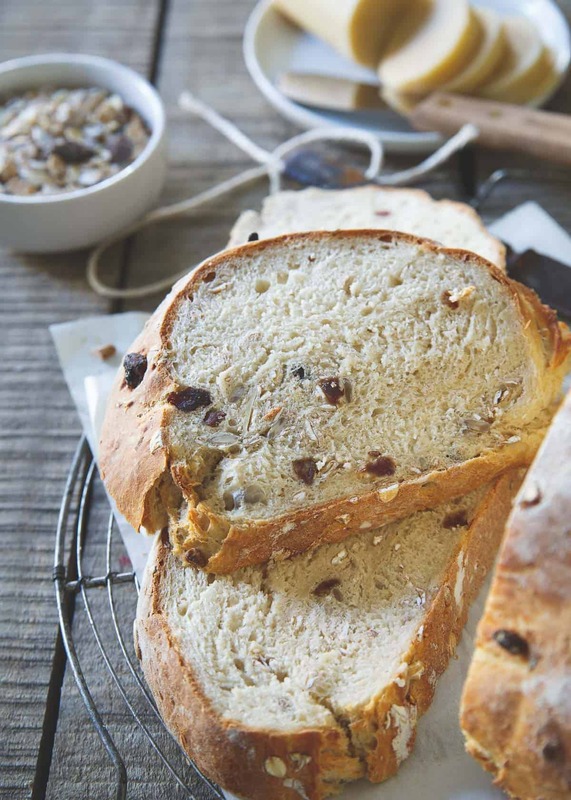 I’ve got a bit of a thing for muesli bread – and sun-dried tomato bread for that matter too. I think I could manage this recipe for myself and it looks so good… now – how do I make it gluten free? This is the loveliest bread! Thank you! Foolproof and all. Hi! This recipe is a must bake. However, I need to sub the flours for paleo friendly. Has anyone made this with almond flour? If so, please share your advice.